I had never heard of a bestselling author writing a book about a radiological procedure, but John Grisham did just that with The Tumor. The book, which is free, explains how focused ultrasound could be used to treat a tumor—a brain tumor in this case—as well as many other medical conditions. Grisham, who sits on the board of directors of the Focused Ultrasound Foundation, calls the book the most important he's ever written. His testimonial on the foundation's website reads, in part, "I have found no other cause that can potentially save so many lives. One day, in the not-too-distant future, you or someone you love will be diagnosed with a tumor. After the shock, you will think of focused ultrasound. Let's hope it's available." 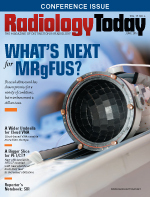 In this issue, Kathy Hardy writes about current and potential uses of MR-guided focused ultrasound. The technology has shown promise for the treatment of many medical conditions, and researchers are finding new uses for it, but it's still considered investigational in the eyes of most payers, which means that many people who could potentially benefit from the treatment aren't receiving it. How long it will take to become a frontline treatment is anybody's guess, but research suggests that it's worth pursuing. Judging by some of the required research protocols, however, it could take some time to amass enough evidence to clear the reimbursement hurdles. In the meantime, many patients will have little recourse but to rely on treatments have longer recovery times than focused ultrasound but aren't necessarily more effective and, in some cases, may be less effective. Also in this issue, Keith Loria looks at new trends in PET/CT and why it may become a more popular option as radiologists look for more diagnostic data and hospitals and imaging centers look for more flexibility in equipment purchasing. We also round up some of the noteworthy news from this year's Society of Interventional Radiology conference and take a look at the continuing evolution of vendor neutral archives as they migrate to the cloud.